We predict the next book by @anya1anya is about #ds106. Design her some cover art. Anya Kamenetz is one of the organizers of the Reclaim Open Learning Contest, and ds106 is proud to have been selected as one of the five innovations being recognized September 26-27 at a MacArthur DML sponsored summit. 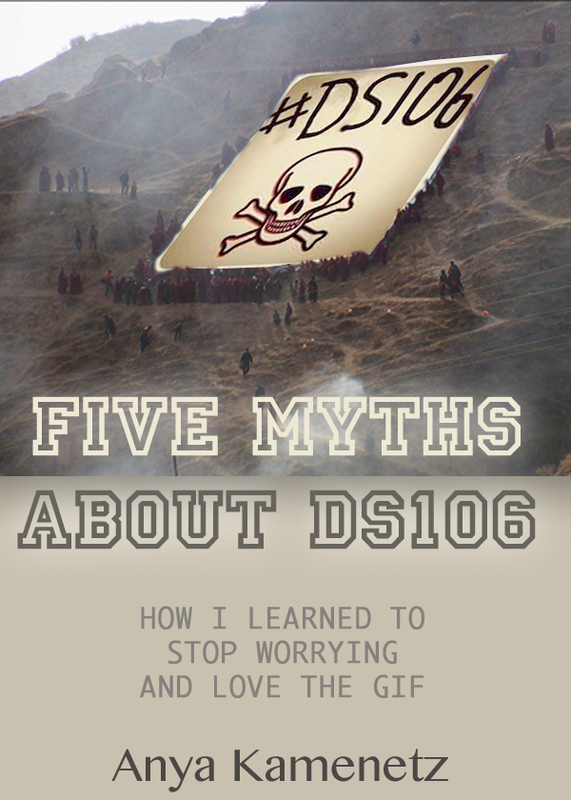 We have a hunch that the author of DIYU Book and many Fast Company articles is going to write her new book about ds106… what else is there to write about? Let’s help Anya out, in a big caring ds106 way, by designing some cover art for this new book, using themes, design elements from her work — and she will get a chance to see this tomorrow when she is a guest on ds106tv. Since this was my harebrained idea to make a daily create for Anya, it meant I had to step up and do it. We are very excited for ds106 to have been named one of the five winners of Reclaim Open Learning Contest. Anya is one of the leads on this project, and asked us to to an online video interview… which of course Jim Groom upped the ante and said, let’s do this live on ds106.tv (10:00am EST tomnorrow). So here was my wayward path… it would have been easy to mock up a version of the pencil in fist cover of her DIYU book. I am counting on some others to do that. I found her recent blogging being done at the Hechinger Report. Her post on 5 myths of educational innovators, part I: disruption, digital natives, and learning styles appealed to me, for one because I like it when people can poke holes in myths. But also, it seems to have a popular book or article these days, it seems to need a reference to a numbered list “Twenty Top websites about X” or “Top Five iPad Apps for Y”. Now, I will school Anya a little bit– the file names says she grabbed it as a screenshot. I took the URL for the image and ran an image search on google for matches, and found the original by Gustavo Thomas on Picassa. It is licensed creative commons, but does have an “ND” so technically I am in violation. Again. Begging forgiveness, Gustavo. But Anya, please give attribution for your images! It’s not a myth but a truth of ds106 to give media credit. SO Is et up a new photoshop document in portrait mode size to be the shape of a book cover, and stretched the image to fill the top. Since it left a gap on the bottom, I selected foreground and background colors from the image, and put in the layer below a gradient fill. To get the ds106 image in place, I am taking on the lesson of Michael Branson Smith, and trying to learn to select using the Pen tool– putting dots on the edge of the selection, and then pressing command-return to turn the shape into a selection. 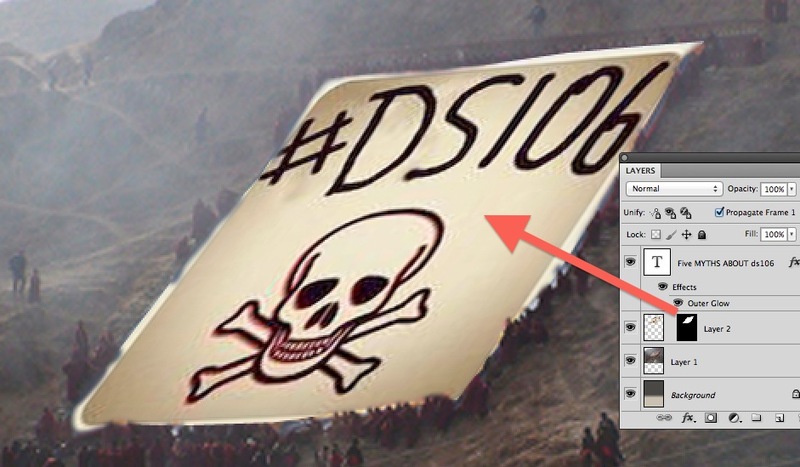 I then opened a copy of the #ds106 logo (made long ago by D’Arcy Norman), and with that selection active, did Edit — Paste Special — Past Into which puts the object into a selection area framed by that shape. Doing this creates a Layer Mask for this image, where white lets the original image show, and block hides it. I used Edit– Transform — Rotate and Edit — Transform — Distort to orient the image and stretch it to try and match the original. The selection was not perfect because on the original, if you zoom way in, there are dark shapes of people’s heads that overlap the edges of the image. That would have been way tedious to create a selection, so my first selection pretty much chopped their heads off (fitting for Headless ds106!). But knowing how Layer Masks work, meant I could activate the black and white Layer Mask, zoom in, and use the paint brush to paint in block (hide image) to let the heads come back, and where I got a bit much of the colored original fringe, to block out that with the black. Fine tuning this edge with a feathered brush made it a bit smoother– not perfect, but good enough. For the font, the title of the book is Princetown Let which nods to higher education by looking like the text on college sweatshirts (I think the title refers to Princeton University). I messed around with the placement, and it seemed like placing it over the bottom edge of the image was interesting. I used the selection tool for each line if the text, and the eye dropper tool to give each line a different color (selected from the gradient on the bottom). Anya’s name is done in a classy serif font, Mynamar MN (I have so many fonts I forget where they have come from). And the subtitle, I through in a third more techy looking monospaced font, Monaco. That was all maybe 45 minutes to create, and double that again for writing up this blog post — which again is part of the creed of ds106 to document the making of and the thinking behind for what we make. We are hoping tomorrow that we can help her in this research. And that is how I daily create! ← Have You Been Daily Creative in Week 2?